- I live with no animals and I don't smoke. - I accept chèque if you're French, otherwise Paypal. - Prices do not include Shipping Cost. It's a series from 2009 and it's the short version, 93cm length. The bust size can go up to 100cm as it's shirred in the back. 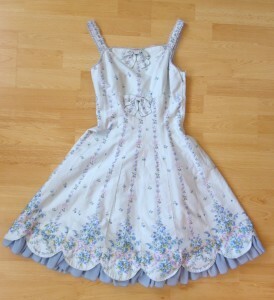 The dress is made of cotton but the bottom ruffle is made of chiffon. The condition is absolutly perfect, I'm the first owner and I've not worn it often.